A sharp pain stabbed the center of my chest as I hauled a forty-pound backpack up the steep trail. We were climbing a long-abandoned logging road following a lightly-forested ridge through a sea of manzanita toward Little Boulder Lake in the Trinity Alps Wilderness. I stopped to give the pain my full attention. The morning sun blazed down on the dusty path. A bead of sweat ran down my temple. It took little effort to convince myself the pain had to be my sternum strap pinching the thin flesh above my breastbone, where wires from my old open heart surgery still coiled. I loosened the strap. Rubbed the flesh. Sure enough, the irritation began to subside. "What's the matter," Barbara puffed, catching up to me on the trail. I explained about the irritation from the sternum strap. Concern flickered in her eyes. "A surface deal," I assured her. "Nothing to worry about." Perhaps. But exactly two weeks later, I felt a pain in the same location as I was working up a sweat on the StairMaster back at home in Blue Lake. Only that pain did not subside. It grew. I suddenly felt lousy and sat down on the carpet to catch my breath. Then I had to lie down. Barbara called 911, the ambulance came, and in little over an hour I was shivering on the cold operating table in the hospital cath lab. A total blockage of a coronary artery had been reopened and stented. Quick emergency response and a skilled cardiologist had spared me debilitating heart damage. A strange thing is an anniversary. Disorienting. Bittersweet. Barbara and I remembered when we first met. 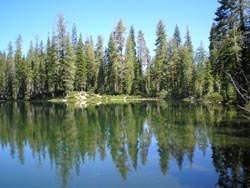 Stoddard Lake. July 1986. We squinted at faded photographs of skinny young folks, tan and lean-muscled. Abundant dark hair. The old backpacking group. We couldn't help but compare and contrast it all with the present. Mr. Popper now gone. We easing into the rhythm of retirement. And all the while the clock continues to tick. Little Boulder Lake was our choice for the first (and, as it turned out, only) backpack of our twenty-sixth season, primarily because the hike was short. Two miles. Six hundred feet altitude gain. It would be a chance to test our muscles and stretch our tendons to see if backpacking was still in the cards for us. Aging is a constant experiment. Also we chose Little Boulder because it is a lovely little lake, with granite cliffs and all the charm and wild beauty of more remote lakes deeper in the wilderness. Its proximity to the trailhead makes it popular, even crowded on summer weekends, but we would be hiking in on a Wednesday morning, when most backpackers should be at work or school. Barbara and I had been there before, but not for years. In 1989, three summers after we first met, we had convened at Little Boulder with the Annual Spring Acid Backpack group. 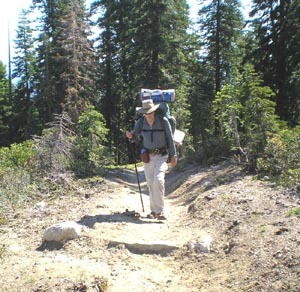 Seeking a more energetic adventure, I had hiked up some three thousand feet into Sugar Pine Lake by myself, spent the night, then cross-countried over a divide to the Boulder Lakes Trail to join Barbara at Little Boulder. And I had returned to Little Boulder with Mr. Popper seven years later to view a total lunar eclipse. On Tuesday afternoon we drove north on Highway 3, over Scott Mountain. A half-mile south of the Coffee Creek turnoff, we turned left on signed Forest Service Road 37N52. In 3.3 miles we arrived at a confusing junction, turned right on unmarked FS 37N53, and in another 8 miles arrived at the trailhead (N 41 03' 53.1", W 122 47' 26.1", 5760 feet). There we found ten vehicles in the roomy parking lot. A long California Conservation Corp van, two Forest Service pickups, a single passenger car, and the rest trucks. Nobody was around. We backtracked to a rustic hunting camp a quarter mile back down the road and parked the van for the night. It was a pleasant, secluded spot, fragrant from the pennyroyal growing all around. The forest was tall and healthy and the soil rich and pungent. The afternoon was warm, with no wind. A few inept mosquitos buzzed around our evening campfire, but not the bad biting kind. The temperature lingered in the upper fifties that night. Wednesday morning we breakfasted on oatmeal and bananas, loaded our backpacks, and parked the van at the trailhead. The same ten vehicles were still there, including the CCC van. A young trail crew must have spent the night in the wilderness. As we were tidying up the van, a VW camper drove in and parked, and the young driver dragged out his backpack, strapped it on, and started up the trail ahead of us. He was heading to Shimmy Lake and on from there to "wherever." 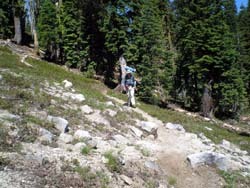 The path continued to climb and soon reached the spine of a spur ridge on the way to the junction with the Little Boulder Lake Trail. Long views opened up of the snowy granite peaks to the west, above Lion and Conway Lakes, and to the southwest above Cub Wallow. It was on this segment that I felt the pain in my chest. And dismissed it as an irritation from my sternum strap. At the Little Boulder trail junction (N 41 03' 08.7", W 122 48' 04.9", 6297 feet) the trail cut southeast to climb over the divide between Little Boulder and Boulder Lakes. The grade eased as we crested the rounded, open ridge strewn with granite sand and white granite rocks scattered like gravestones. As we descended the steep drop through boulders and around granitic outcroppings to enter the lake cirque, the flora changed abruptly. Manzanita gave way to Sadler Oak, which has taken over the job of tripping passers-by and choking the understory into an impenetrable wasteland. Approaching Little Boulder, we descended new granite steps and encountered our first humans. 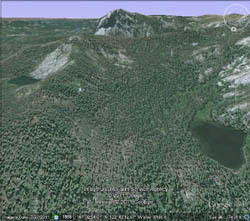 A middle-aged man and woman were herding two boys in their early teens up the trail on a dayhike to Boulder Lake. They lived in the San Francisco Bay area, they told us, but had a summer place in nearby Douglas City. They were camped at the best campsite at the far eastern end overlooking Little Boulder. That, alas, had been our destination. No one was at Little Boulder when we arrived. We found an excellent campsite right on the north shore (N 41 02' 51.5", W 122 47' 47.9", 6329 feet), where we stopped and offloaded our packs. Barbara remembered the sprawling site to be where the ASABP group had converged in 1989. Tiny azaleas ringed the water's edge, not yet fully bloomed. Tall trees offered good hammock anchors. Red fir, tall and slender and open with massive yellow cones at the crowns. White fir. Unhealthy lodgepole pines in the wetter regions. White pine with new cones dangling down, curved like ten-inch bananas, not yet open. All set in a sea of Sadler Oak, under whose green foam a man could easily drown. Directly across the lake to the south rose the towering white wall of granite and talus left by a departing glacier. And I remembered it as the campsite Mr. Popper and I had taken when we hiked in together to watch the total lunar eclipse in 1996. The whole deer-slaughter fiasco came back to me like a vivid dream. It had been hunting season. I was in the lead across the narrow outlet dam a little further along, when I had nearly bumped into one seriously creepy armed killer as he lurked silently against a tree trunk at the far end. All swathed in camo, face smeared with black, rifle at the ready, he neither spoke nor smiled. Just stared. Homicidally, it seemed to me. Like a renegade special forces assassin. Popper and I had turned back instantly and set up camp at this same campsite. The hunters were camped at the far end of the lake. They made us uneasy, so we had no intention of crowding their space. It was clear that they were going to kill something before they hiked out. It turned out to be a big buck that they wounded at first light the next morning, shocking us awake. Like vultures they perched on the shore as their wounded prey swam round and round in weakening circles in the deep, silent, silvery water. Waiting for it to crawl out by itself. Sport hunting. They had not looked sporting to us. Barbara and I dug out the food bags and deployed our mats. After lunch a flock of jabbering children arrived at the lake. Three young men supervised them. Fathers, we presumed. Most of the crowd wore flip-flops instead of hiking boots. They went for a long, noisy swim before heading back up the trail to Boulder Lake. One young man led his four-year old daughter on a shortcut up the stark mountain of sharp granite boulders across the lake. There was no hint of a trail. We followed their progress with binoculars as they slowly picked their way up and over the crest to Boulder Lake. We hiked across the outlet dam and explored the east end of the lake, careful not to intrude on the occupied campsite. Back at camp, I went in for a swim. Two dayhikers came in, a mother and daughter, and jumped in. They swam to the other side of the lake, staying in the brisk water for nearly a half hour, and came out white-fingered, blue-lipped, and cold. As we lounged in our hammocks, an intrepid chickadee landed beside a hole in the ragged shard of a long-dead snag at the waterline, not ten feet away. The little bird eyed us, then ducked into the hole. In a moment he popped out and flew off, followed by a second chickadee. Over and over again, like clockwork, the industrious pair brought insects to a brood of nestlings inside. We could barely hear the babies chattering each time a parent arrived at the nest. For our evening entertainment an osprey perched on a bare branch across the lake, circling, hovering, and diving for fish. The weather was mild. Mosquitoes were few. They had been worse at the trailhead. Here on the moraine on the north shore the forest was more open, and on the south stood the sheer wall of granite. The sky was clear and the first of a million stars began twinkling. As a frog chorus was tuning up, we retired to our tent. Early Thursday morning, the other backpackers left as we were eating breakfast. I ambled over to check their digs. 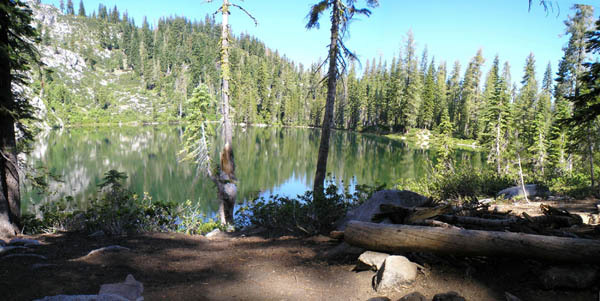 It was the lake's premier campsite (N 41 02' 47.7", W 122 47' 43.5, 6347 feet), with a commanding view of the entire lake and an impressive bench above the campfire ring, where you could sit on a flat log and lean back against a sloped boulder. Solid. Sturdy. Comfortable. Slabs of clean white granite, tumbling into the deep water, bore a few sturdy trees, but on a hot or windy day the site would be very exposed. In the late morning we hiked over to Boulder Lake, an obligatory ritual. On the way we came upon a young man hiking to our lake to "finish up" the work on the granite steps along the trail. He said there was nobody at Boulder Lake except for some of his CCC crew. The rest of the crew was camped down at Boulder Creek crossing. They had just finished brushing the trail to Lion and Foster Lakes the day before. As we chatted, we saw a Clark's Nutcracker land on the trail, a large, striking bird with long, pointed black beak. The trail back down to the junction seemed steeper than we remembered, as was the downhill to Boulder Lake. Where our trail met Boulder Lake was a major trail junction. Trails were signed south to Poison Canyon and Lilypad Lake, west to Coffee Creek Road (and Boulder Creek and Lion and Foster Lakes), and back north the way we had come to Little Boulder and the trailhead. There at a large horse camp we sat on campfire logs and enjoyed a leisurely lunch. Azaleas ringed the shore. Pond lilies floated on the still, shallow surface. Mosquitoes would probably be a problem in the evening with the moist soil and dense manzanita understory. After lunch we hiked south along the east side trail. Beyond the lake's south end a spur trail crossed an inlet creek to a big wet meadow. Beyond the meadow lay a great campsite with good lake access. The Poison Canyon Trail continued its energetic climb southward, but we let it go. Back at the main trail junction where we ate lunch, we encountered the same CCC youth laden with heavy trail tools across both shoulders. Axes. Saws. Mattocks. He was retrieving the tool cache from the Little Boulder work site. No one was at our lake when we returned home. So we went in for a swim from the boulders at the vacant main campsite, then rested there on the neatly crafted bench solidly overlooking the lake. So relaxed were we that we may have dozed off for a while. Neither of us was sure. Friday dawned clear and beautiful. The lake was a mirror. Calm. Peaceful. Reflecting the granite wall across the lake. And ourselves. And hummingbirds hovering over the water. As we sat quietly drinking our tea and mocha, I thought about the scourge of multitasking, so popular among youth. I came to the realization that Zen is the art of untasking. An antidote to multi-tasking. A notch down from doing nothing. Pure non-doing. We broke camp and by eleven were ready to hoist our backpacks and get on the trail. At that moment four horseback riders descended the steep trail to the lake. Two men. Two women. Cowboy hats and saddlebags. They were leading two heavily laden pack horses. Looked like enough gear for a stay of weeks. Wow, I thought. We're getting out just in time. But they had not come to camp. 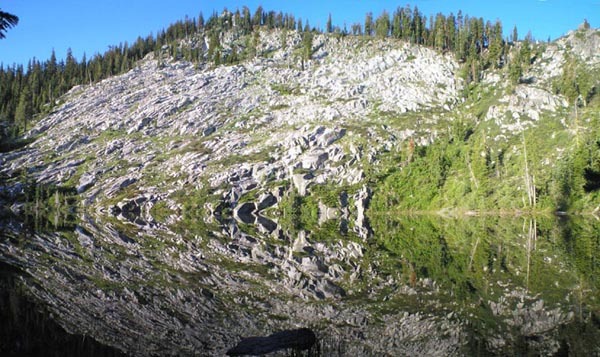 They were volunteer backcountry horsemen and were there to stock Little Boulder Lake with Eagle Lake Rainbow Trout. We watched them unload from the pack frames huge plastic cooler chests packed with dry ice and large plastic bags filled with water and oxygen. Confused eight-inch trout stared dully from the bags. The big fish were an experiment, we were told, as they used to bring in thousands of fingerlings. Another group with ten horses and five riders were on the trail behind them. 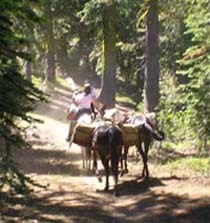 As we hiked out we met the second wave of horsemen and stepped off the trail for their pack train to pass. We also met scads of dayhikers coming in with fishing poles. Somehow they knew that Little Boulder Lake was the place to be for good fishing that day. Two weeks later we were preparing to meet with friends to plan our next backpack. But the heart attack scuttled all plans for another trip in our twenty-sixth season. I can't help wondering about that pain in my chest on the trail to Little Boulder Lake. Had it really been just my sternum strap? I suppose I will never know for sure. But I am haunted by visions of what might have happened if a heart attack had felled me on that wilderness trail, many hours away from help. And I wonder about next year. Will Barbara and I have a twenty-seventh season? Dare I risk another backpack? I guess I will cross that bridge if and when I come to it.